Ladies and gentlemen, it is my great pleasure to introduce you to Rhonda. Isn’t she just the purtiest, just the pinkest, just the baldest little birdy you ever did see? Rhonda is my 2009 Thanksgiving Turkey, but unlike the nearly 45 million unlucky others, Rhonda will be alive and well the morning after T-day. Rhonda and her rescued companions will live out their days feeling the sun on their backs, enjoying the pleasure of a summer dust bath, and living a truly free-range existence. But many other birds – literally hundreds of millions of birds – are not so lucky. If you want to learn more about the poultry industry in general and the turkey industry specifically, including ‘cage-free’ fallacies, here is a great place to start. Or if you’re just interested in becoming better acquainted with these affectionate animals, Colleen Patrick-Goudreau shares inspiring stories of her own experience working with rescued turkeys at Farm Sanctuary. 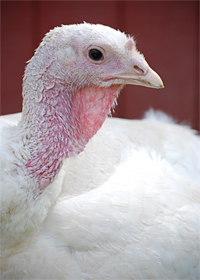 If you’d like to get involved and help, you can do like we did and sponsor a turkey too! A one-time donation of $25 goes to the turkey of your choice, and you’ll even receive an adoption certificate in the mail. What a wonderful way to celebrate a holiday centered on the principals of caring and sharing, no? Compassion – now THAT is something to truly be thankful for! I am totally doing it too! What a cute baby turkey. <3 I want your shirt. lol. Have a fantastic day Sayward! Have a fantastic day too, and an wonderful Thanksgiving! What a fabulous effing idea! Love it! @ Tenise Rae – I know! It feels really good to make a positive gesture in the ‘other’ direction, on that day. @ Carnivor – You spelled your name wrong. I think Curd is wrong too,,, must be all the meet! @ CarnivorE – Haha, it is, but I thought correcting it would be overkill. I’m so happy we don’t have the tradition of Thanksgiving back home in Estonia, just another mad meat-eating holiday. Although.. I guess it has been replaced by Midsummer’s Eve where they do bbq like crazy. It’s actually quite interesting how I’ve never really liked cuddling animals and have a bad phobia for birds. Especially chickens and domesticated birds. I find it funny since I’m a vegan, the biggest reason being ethical views and animal rights. I could never ever adopt a turkey because I’d just be SO afraid to go near it. Although I love watching birds and animals at a distance. I get so much more energy by just feeling the nature and seeing them in their normal habitat. I guess. Rhonda is so posh! I love this idea, and I will have to pass it on! How wonderful! Rhonda is a cutie! 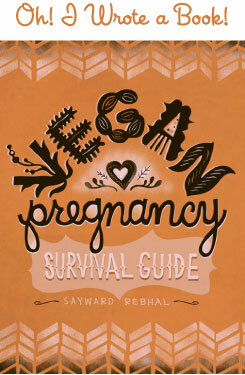 I wish our kids were closer in age, I would love to have what I know are going to be your fabulous baby food recipes. Kaya all of a sudden got very picky about what she will eat and what she won’t. We tried hard to keep to a vegan diet but it was at the point that all she would eat was fruit and bread and that just wasn’t okay. We had to introduce eggs to her diet because that is the only way I can get veggies into her (pureeing them and mixing them into an egg scramble), ditto for tofu. It needs to be either cooked into eggs or mixed with fruit for her to even touch it. Do you have any suggestions for tofu recipes? YAYYYYY! When you say Happy Turkey Day, you’ll really mean HAPPY TURKEY Day!!!! Turkeyriffic idea!!! Hat off and feathers on to ya. @ Hope – Haha, yes! Doesn’t she just look so dainty and glamorous? @ Jennifer – Thanks, and I agree on the cuteness for sure! @ Julie – Well tofu is so neutral that you can hide it in just about anything. Applesauce, fruit smoothie, etc are easy. I know you’re probably not doing peanut butter yet, but can she have other nut butters? I bet tofu + almond butter would be great. Also may lightly pan fry the tofu and sprinkle with cinnamon, try making it a sweetish treat? Do you have a juicer? If you’re worried about veggies a great thing to do is juicing, because you can hide quite a bit of spinach or other greens in a really sweet and tasty carrot-apple juice. It’s great for kids. Also, anything mashed with avocado seems to do the trick with little ones, and avocados are sooo great – perfect for babies ‘case they’re high calorie and full of healthy oils, plus some protein and good micronutrients. Okay that’s all I got for now, but I’l keep thinking on it.